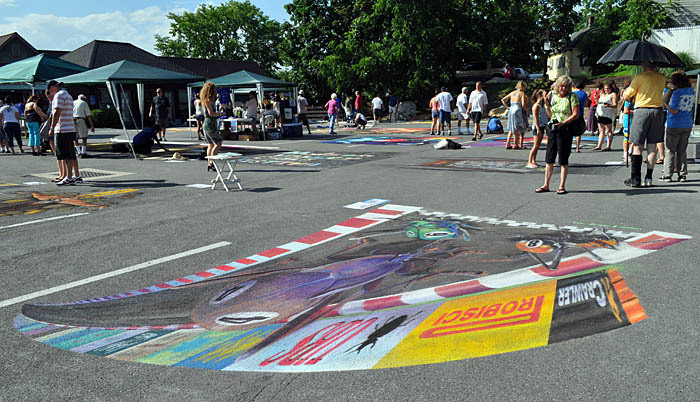 We were happy to return to the second annual Hudson Valley Chalk Art Festival in New Paltz, NY, held over the weekend of July 13-14. This year, we were able to start painting on Friday, as scheduled. We thought we'd try creating an image where people could ride on top of an object in the painting. It didn't quite work out that way, but we liked the resulting painting anyway. 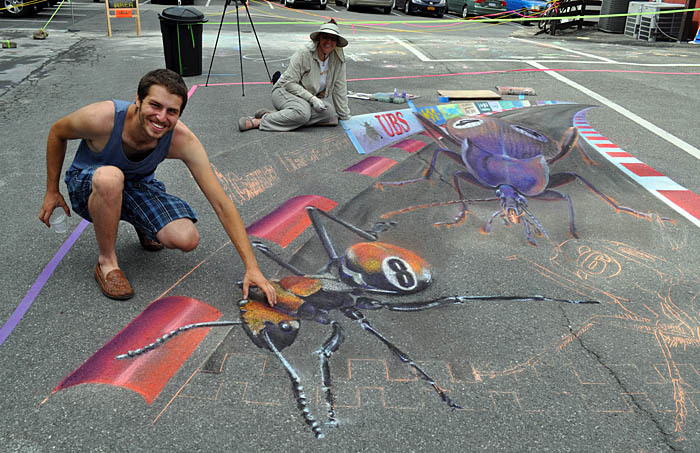 Our subject this year was insects. 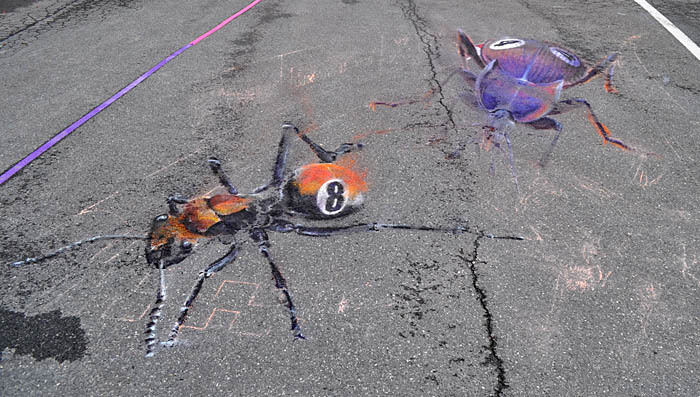 Cheryl wanted to play with our sense of scale and allow people to interact with something either much larger or much smaller than human scale, and we found a lot of fascinating images on Dr. Alex Wild's website. Alex Wild is an entomologist and photographer in Champaign-Urbana, Illinois with an amazing collection of insect photos (particularly ants, his specialty). We're so glad he allowed us to use his photos for this painting. 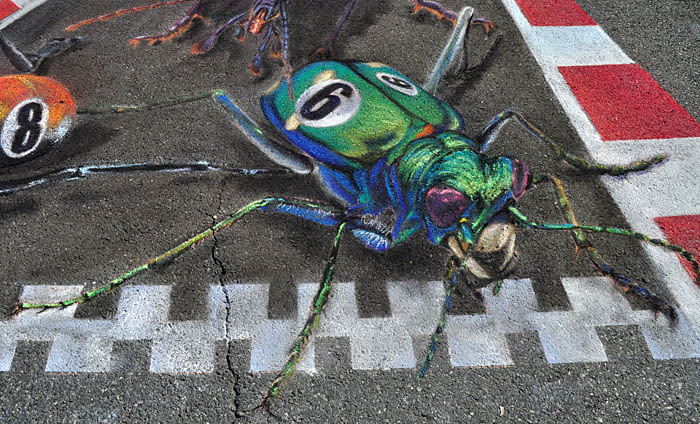 Rather than just create a painting of an insect or two, we needed to come up with a story to tell, so we decided on having an insect race, complete with insect-theme advertising banners along the side of the road. Soon after we started work on Friday, a family came by to see the paintings. 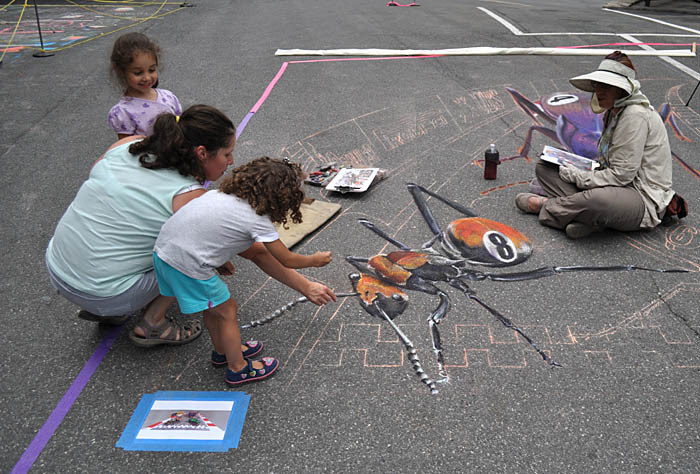 The older girl is interested in art, and Wayne got her to help him with the ant antenna. Her little brother, Bryce, is planning to be an aeronatical engineer (he was quite a memorable character!). 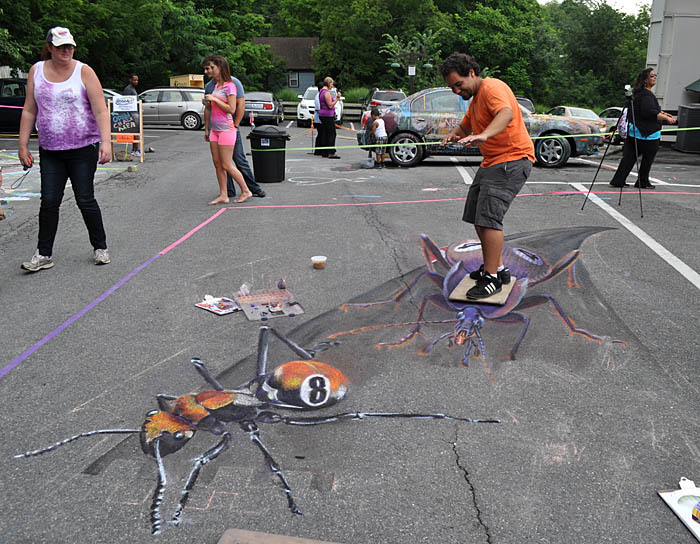 The insects turned out too small to ride comfortably, but visitors could still "feed" the ant! 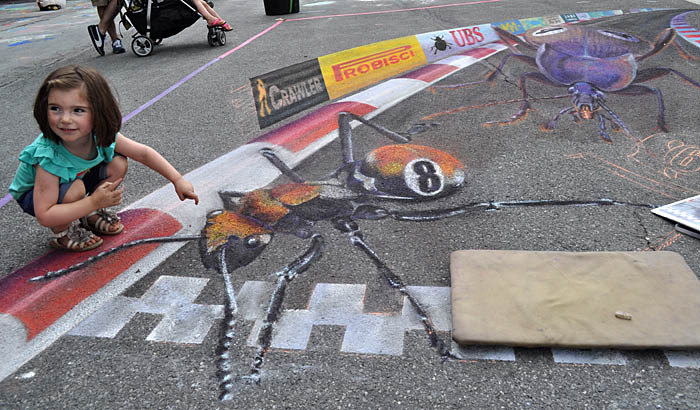 The ground beetle--bringing up the rear in the race--was the only insect even close to large enough to ride. We covered all the paintings Friday night, but awoke Saturday morning to evidence that it had rained overnight. 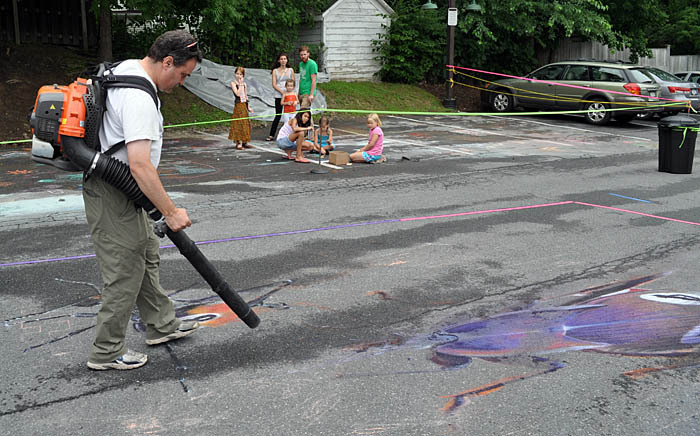 When we got to the festival site, we discovered that many of the paintings had gotten wet. 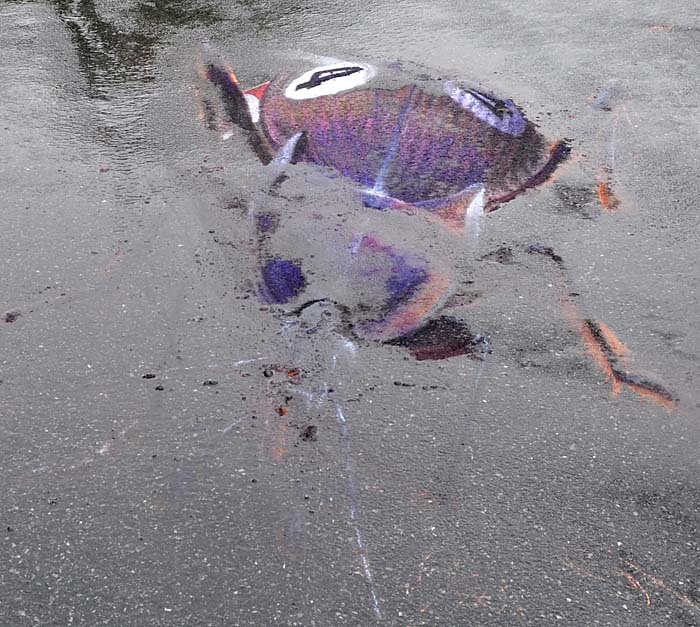 Ours was downhill from the rest of the parking lot, and we learned that a crack in the pavement allowed water to flow under our plastic sheeting. Here's what the ant looked like when we took off the plastic. 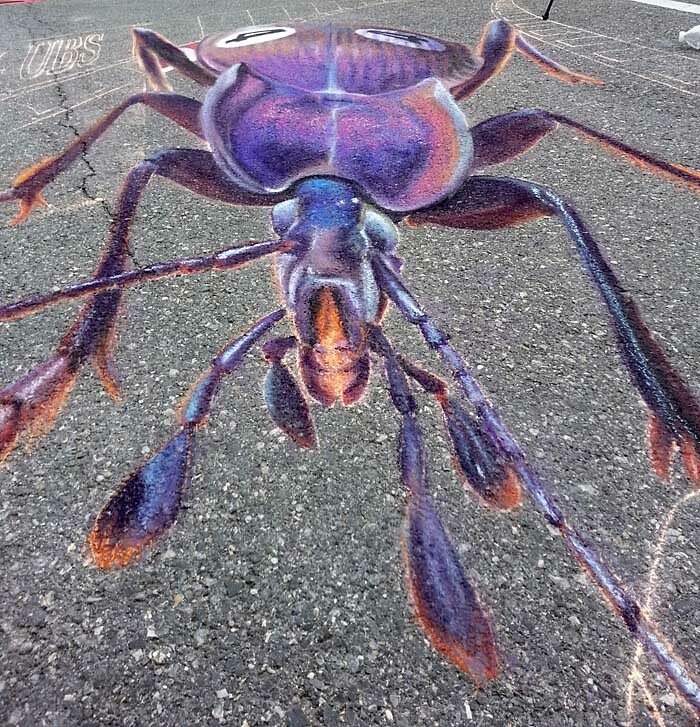 And this is what the ground beetle looked like. But never fear! 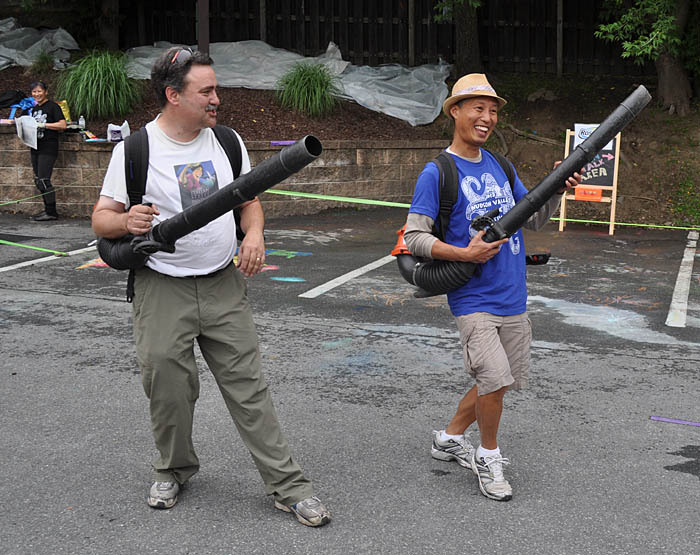 Wayne and Joel donned rented leaf blowers to blowdry the paintings and save the day! 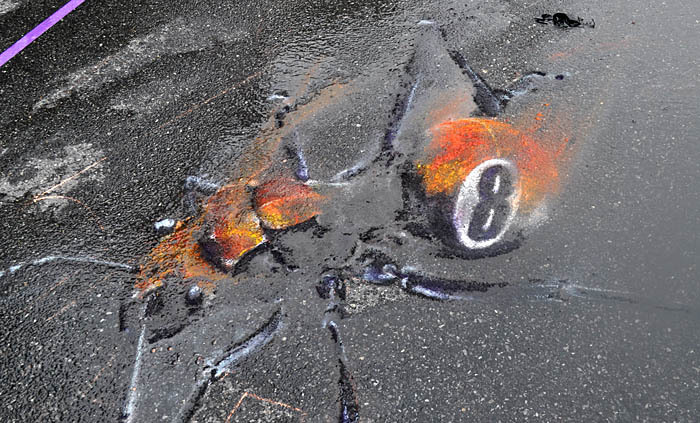 Normally, strong winds are not our friend when street painting, but this painting couldn't lose anything more from wind than it already had. We were surprised to find that more of the painting had survived than we thought! With two of the insects recovered, we moved to roadbuilding. This guy tried surfing on the ground beetle. Cheryl tried riding on the beetle's back, but she hid too much of the beetle. We'll try this riding idea again sometime. 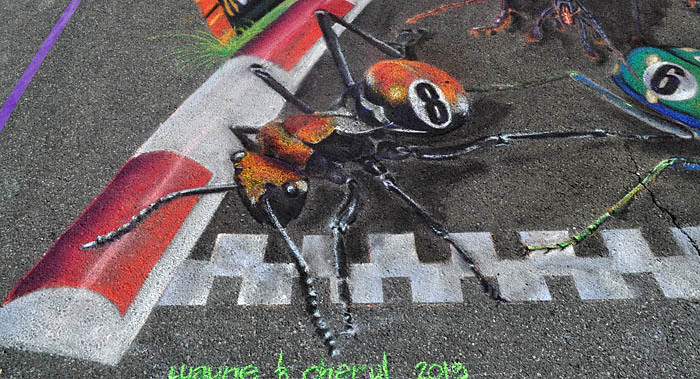 After a rainless night, we had two insects done, a bit of the road surface, and one curb. 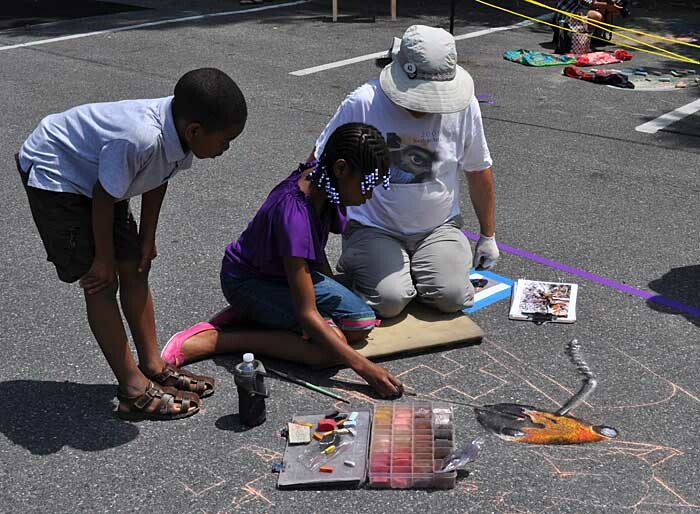 We were thrilled to meet this entomologist and his girlfriend, and he was thrilled that we were painting insects. So we had him pet the ant for a photo. 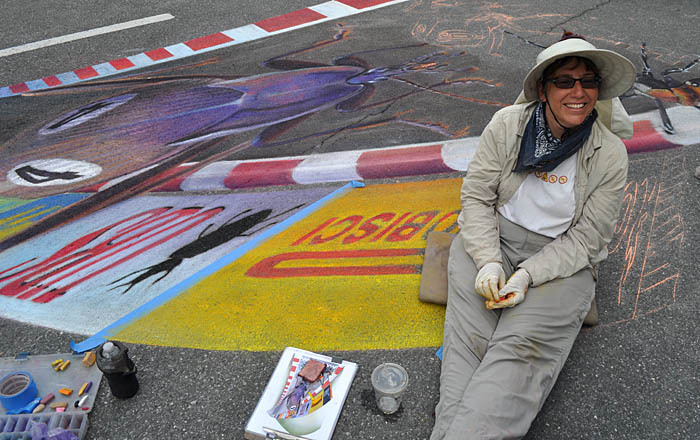 Cheryl painted the advertising banners lining the racetrack. 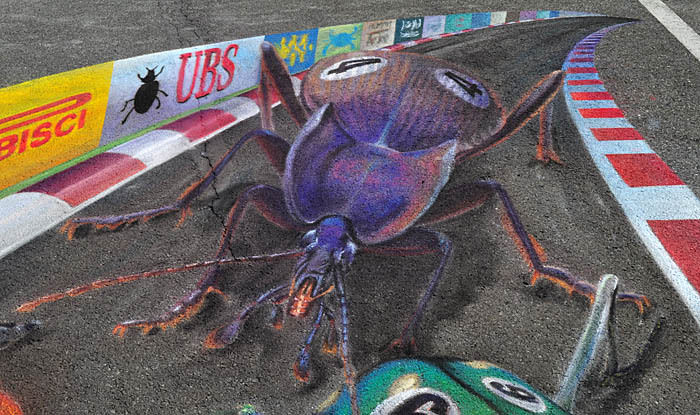 Based on real racetrack ads, these were adjusted for an insect race. This little girl offered our ant scritches. 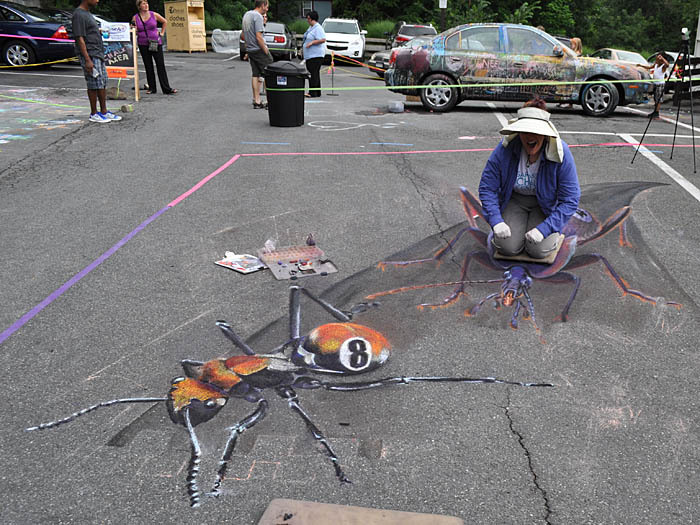 Our friend Sharyn, however, thought this was a perfect use of her insect repellent! It's a photo finish! Or a photo of the finish. Here's a close up view of the Golden Spiny Ant. And the ground beetle coming from behind. Here's what the painting looked like from the top corner.